Arrow season 4 has come to a close, and as the events of the finale are processed, it is now time to examine the season as a whole. This was going to be a transitional season for the show; it was to be an answer to the shortcomings of a disappointing season 3 that pushed its characters too far into dark hero territory. Now Arrow is by no means a lighthearted show, but there are limits to everything, especially when it comes to a gloomy tone. And while the series took aim at giving its story and its characters a lighter touch early on in season 4 – going so far as to make Oliver Queen's pursuit of "the light" part of the actual text of the season – old habits die hard it seems. After an getting off to a solid start by introducing an Oliver Queen at peace with himself and his place in the world, the show did what any series would: it brought conflict into the life of its characters and used that to set the plot in motion. Along with some snappy new duds for the hero, the Arrow also tried its hand at introducing a new status quo for its core group, one that hinted at shifting power dynamics within Team Arrow and the personal lives of Oliver and Felicity. But when the season became bogged down in flash forward reveals and a slow-paced plot of a super powerful antagonist in Neal McDonough's flashy Damien Darhk – a character whose ambitions never quite matched up with the hero's journey – the show felt destined to repeat recent past mistakes. Even Stephen Amell admits that Arrow works better when it's allowed to do the things that it does best. As the first two seasons demonstrated, the series has a knack for telling street-level crime stories with just a pinch of supervillainy thrown in for good measure. What made seasons 1 and 2 stand out was the personal nature of the overarching story that still hit the sweet spots familiar to most superhero tales. As the series progressed, it was compelled to respond to the burgeoning comic-book universe it helped spawn, and that response may have attributed to Arrow losing sight of what its particular skill set is. The results may have been mixed for the last two seasons, but there was a clear ambition in season 4 to alter the scope of Arrow and to see Oliver Queen change along with it. Without being too cheeky, there was something magical about the idea of magic and mysticism being introduced into the Arrow universe and to see how the human, "superpowerless" characters of the series would respond as something so fantastical not only entered their lives, but become a major threat to them as well. The ambition, then, extends to Damien Darhk, who, over the course of the season, became a bright spot in nearly every episode he was in, thanks to the lively, scenery-chewing performance from Neal McDonough. Seeing the series bring in a gleefully mad character like Darhk and to just let him do his thing opposite the typically more serious performances of Stephen Amell, David Ramsey, and Willa Holland was a nice change of pace. As mentioned above, the early part of season 4 was, in many ways, a direct response to certain criticisms leveled against season 3 – particularly the darkness of the Ra's al Ghul and League of Assassins storyline. It was a season filled with death and resurrection, one that saw the usual bright ray of light named Felicity Smoak turned into a dour presence who was always on the verge of tears. The season 4 premiere, then, made good on promises from the season 3 finale that saw Ollie and Felicity as a happy couple who literally drove off into the sunset. And, true to its word, season 4 delivered a new Oliver. He smiled, he interacted with neighbors, he brunched. He also saw there were limitations to what he could do as a masked vigilante whose interactions took place with unsavory types and only at night. From this was born Ollie's political ambitions that, although a means to combat Damien Darhk's methodical dismantling of Star City's government, showed his ability to become something else wasn't exclusive to shooting arrows into peole. For Oliver to try and change the city via legal means and to act within such specific boundaries – further rehabilitating his pre-island spoiled son-of-a-billionaire image in the process – made for a compelling commitment from the show's writers that Arrow's dark days were perhaps finally behind it. As much as Arrow season 4 wanted to present itself and its title character in a new light, some things aren't so easy to change. As Felicity noted when breaking up with Oliver after learning he'd kept knowledge of a heretofore-unknown lovechild from her at the request of his baby mama, Oliver is just built to be secretive and selfish. It's not a great look for anyone – let alone the hero – but hey, the guy's trying. And while Oliver took a few smiles out for a test drive earlier in the season, it wasn't long before he had settled back into a familiar stone-faced routine as Team Arrow's troubles mounted. So what's a show to do when getting a case of the glums is built into its DNA? For Arrow, the answer has been to strike a balance in the tone with characters whose disposition is, let's say, a little sunnier. This responsibility has fallen on Felicity over the last few seasons, but after the character misfire that was her arc in season 3, and the fact that her involvement with Oliver has gone beyond her tech role on Team Arrow, the show needed a new source of levity. So Arrow brought in Curtis Holt (Echo Kellum), resident tech genius for Palmer Technologies and all around decent human being. In addition to being a superhero in the making, Curtis works as an audience proxy of sorts. His introduction to Team Arrow is filled with the sort of gee-whiz enthusiasm you might expect if a die-hard comic-book fan learned superheroes were real. Curtis' earnestness and dorky sense of humor helps cut through some of the show's necessary seriousness; his presence brings balance to the tone, bringing not only levity to some heavy situations, but also a sense of hope that anything can be accomplished. Curtis is a valuable member of Team Arrow and it's good to see him added to the regular cast in season 5. Broadcast network seasons being what they are – i.e., too long – sometimes it is beneficial for the big bad to show up a little later, to linger in the shadows for a few episodes before showing his or her face and making things worse for the hero. To its credit, in addition to a less burdened Oliver, Arrow had something special in Neal McDonough's performance as Damien Darhk and so it makes sense that the show would want to start things off by putting its best foot (or feet) forward. Darhk's name even served to underline the overarching theme of the season, so why not, right? But charming as McDonough's performance was, a villain needs a good plan and a sense of urgency to be a compelling adversary. Darhk's plan (his ultimate plan, anyway) wasn't revealed until the last few episodes, and so he spend much of the season doing magic hand-waiving motions at stuff and proving that a supervillain can have it all – a promising career as a homicidal maniac and a wife and kids – if he's willing to dedicate time to both. But Arrow struggled to realize the threat the character represented on a consistent basis. Instead of dedicating a smaller but more concentrated amount of time on Darhk and HIVE's plan to reboot humanity, the season allowed the villain to come and go as a way to generate tension for one early-in-the-season reveal. This underserved Darhk as the big bad for much of the season. If Damien had been given a clearer objective sooner, and wasn't used as a plot device to introduce a character death much too early, his presence might have felt more threatening than it ultimately did. The early introduction of Damien Darhk was in part due to the Arrow writers needing a reason for the flash forward scene that promised someone from Team Arrow would die before the season was out. This was one of those techniques that created a lot of speculation amongst those watching. That conversation was maintained throughout the first half of the season, as every episode became less about watching to experience the story unfold and more about hunting for clues as to who would wind up taking a dirt nap. Although there were some fake outs – like Felicity's gunshot wound before the midseason hiatus – it wasn't until episode 18, 'Eleven-Fifty-Nine,' that an answer was given when Laurel Lance died after tussling with Darhk. The mystery set up in the premiere boils down to a question of: What did knowing someone was going to die so far in advance add to their death? When you consider the time it took for Arrow to get around to answering that question, it seems pretty obvious: Not much. In addition to destroying the dramatic tension of knowing a member of Team Arrow would die, the 17-episode wait (from October to April) just felt like too much a stall for time on behalf of the show. What can be said about the island flashbacks at this point? It was a narrative device that worked well during seasons 1 and 2, when the difference between Oliver on the island and present-day Oliver were greatest. Now, there's little to distinguish between the two versions (Amell has even ditched the wig at this point, so he looks the same in the past as he does in the present) and the device probably should have been dropped in season 3, or at least modified to the point that only one or two episodes per season had to deal with it. While the return to Lian Yu is far better than Oliver's adventures in Hong Kong, the tiny snippets of story involving Baron Reiter, Taiana, and a magic idol have afforded season 4 little beyond a John Constantine appearance and hints at a trip to Russia in season 5. Co-showrunner Wendy Mericle has addressed the issue of the flashbacks already, and promises they will offer more to the story moving forward. That's good news, as it seems despite the device not really working the past couple of seasons, the show is unwilling to just do without flashbacks altogether. If Arrow has to have flashbacks spread throughout the season, it would do well to focus once again on just how much the experience changed Oliver on a personal level, instead of simply making them the adventures of a superhero who just hasn't found his nickname yet. Maybe the biggest problem with season 4 was how the series missed opportunities to capitalize on everything that was clicking early on. Oliver was changed, there was a considerable shift in the tone of the series, the prospect of Green Arrow versus an evil powered by supernatural forces was compelling, and new additions to the cast were welcome. And somehow it all slipped away as the season became caught in the narrative math of making the grave reveal add up and keeping the big bad interesting as the story spun its wheels until Darhk's master plan could be revealed. Stalling for time meant the show would take big swings with dramatic moments like Felicity being paralyzed and Oliver finding out he had a 10-year-old son. Both threads felt huge and worthy of greater examination, but season 4 kept them around just long enough to keep the larger questions at bay. As a result, neither scenario felt as though it carried any weight. Oliver's son and his mother left for parts unknown and Felicity's spine was fixed with a microchip. There was no sense that either event carried actual consequence. Sure, Oliver and Felicity split up due to his lying about William, but that is by no means the most important aspect of Oliver's decade-late journey into fatherhood. Considering Arrow began with Oliver's father dying to save his son, and with the father-centric storylines of Thea and Felicity being rather prominent this season, seeing William shuffled off to who knows where is a missed opportunity, especially in a season where Oliver was intended to be aware of his need to change. As always, there were things to appreciate over the 23-episodes that made up Arrow season 4. It was uneven at times, to be sure, with the series struggling to find where Oliver Queen and Team Arrow fit in a world with The Flash and Legends of Tomorrow in it. In the end, it seems the Green Arrow can coexist with characters that wield supernatural or otherwise fantastical powers, but as earlier seasons have demonstrated, Arrow is just better suited to telling stories that highlight its heroes' particular non-powered skillset. 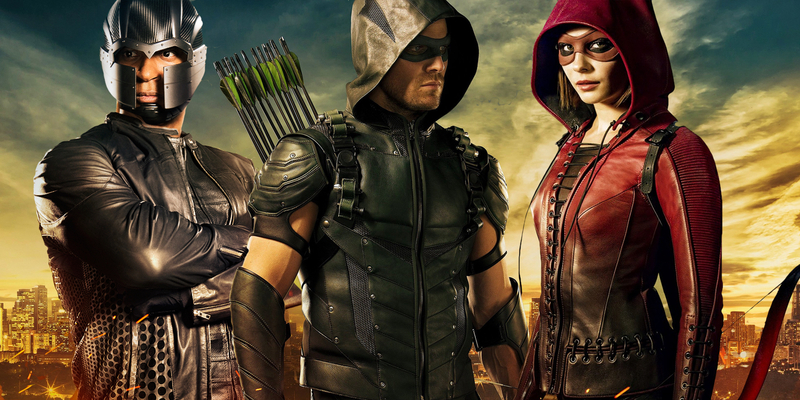 Arrow will return for season 5 in the fall of 2016 on The CW.